Yes, wash your vehicle. Those drive-through car washes take little time and energy to get from one end to the other. Especially during this time of year, when the road salt and other debris from the winter is caked on your vehicle’s exterior paint. Even bug splat on a vehicle’s paint could be responsible for corrosion and eventual long-term damage. 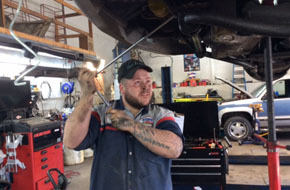 Check your vehicle’s fluid levels, although if you feel like this operation is beyond the scope of your abilities/preferences then you can trust the mechanics and Willard’s to inspect your vehicle. Check the motor oil, coolant, power steering fluid, brake fluid, and even the transmission fluid. Every vehicle is going to have an owner’s manual where the exact order by which you can the fluids is written out. Tires are very simple and easy to check, and they should be inspected regularly. It’s simple to remove the valve cap and use a tire pressure tool to ensure that the tires are within the vehicle’s appropriate operating range (the appropriate PSI is listed, on most vehicles, either on the door panel of the driver’s side door, or written in the manual). And you should have the mechanics at Willard’s rotate those tires so that they wear evenly. The air filter is a simple device that, on most vehicles, is simple to replace. Check your vehicle’s owner’s manual for directions, or if you have any trouble, or don’t want to mess with it, then again take the vehicle to Willard’s. Car maintenance is rather simple and straightforward, and the number one most important thing to remember is to stick with it, and make a routine of doing it.